Charlottesville Orthopaedic Center works with patients in both Charlottesville and the surrounding communities, we treat musculoskeletal conditions in a variety of categories including the services listed below. We are also a full-service orthopaedic center, and we feel confident that we have a specialist for whatever your individual needs are. Please see below for an overview of our core services and specialties. HAND Fractures, joint sprain, arthritis, and lacerations to skin, tendons, and nerves – when these conditions or injuries affect your hands and fingers, they can have a significant impact on the activities you perform every day, from opening a door to typing an email. Our fellowship-trained hand surgeons will explore various treatment options with you, from non-surgical therapy to surgical joint replacement. 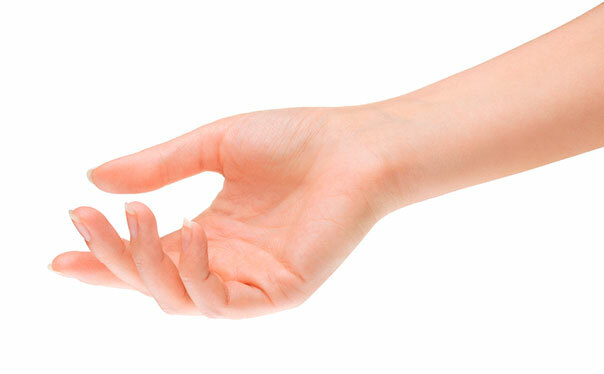 Our goal at Charlottesville Orthopaedic Center is to is to improve your hand function as quickly as possible. WRIST If you’re suffering from one of many common wrist problems – carpal tunnel syndrome, fracture, arthritis, and tendonitis – our comprehensive, multidisciplinary approach to care offers immediate treatment and helps you avoid significant delay and downtime. Our physicians perform in-house, noninvasive diagnostic tests such as electro-diagnostic medicine (EMG), musculoskeletal ultrasound, and Vision Scope. We also perform outpatient wrist MRI, CT, and arthroscopy (wrist scope). ELBOW If you have problems with your elbow, we can help. 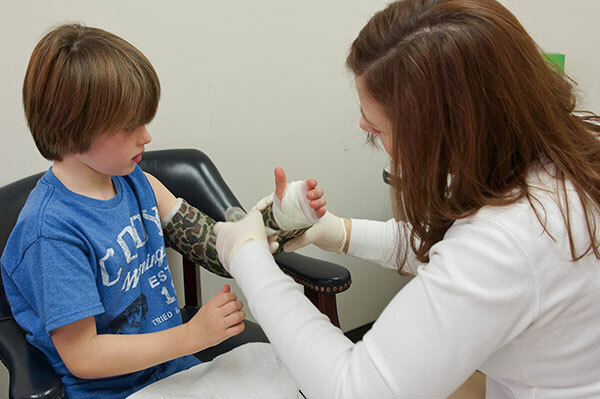 We treat the full array of conditions: pediatric fracture (which includes supracondylar), chronic nerve impingement, tendonitis (golf and tennis elbow), and arthritis. Not all elbow conditions require surgery immediately, so in our approach to care we start with non-operative regenerative therapies such as ultrasound-guided platelet and stem cell injections. Meet our Hand, Wrist & Elbow specialist and the other members of our expert medical staff. If shoulder pain prevents you from living the life you want to live – throwing a baseball, lifting your children, or returning to work – then Charlottesville Orthopaedic Center can help. By carefully reviewing your medical history and conducting a physical exam, as well using x-ray and ultrasound technology, we can diagnose your condition and develop a plan for treatment. We’ve found that most shoulder conditions can be managed with physical therapy or, in some cases, an injection. 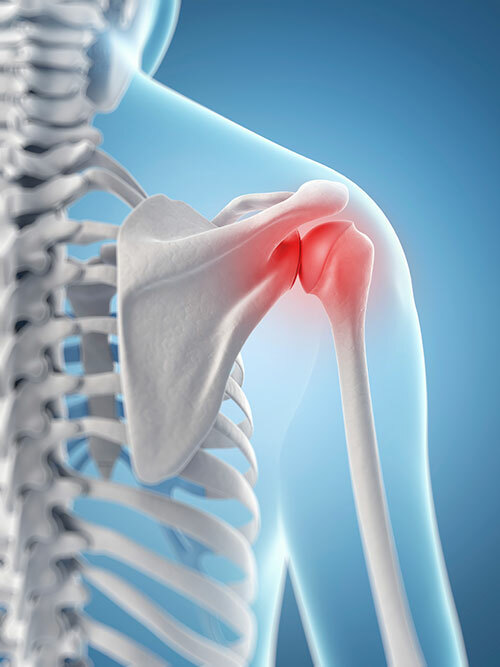 If those approaches don’t resolve your problem, then you can meet with our orthopaedic surgeon who specializes in shoulders to discuss the benefits of surgery. When your shoulder is compromised through injury or the normal wear and tear of repetitive use, pain and instability lead to loss of functional use. Our goal is always to help you eliminate pain and enjoy a full range of motion so that you can participate in the activities you enjoy. Meet our Shoulder specialist and the other members of our expert medical staff. 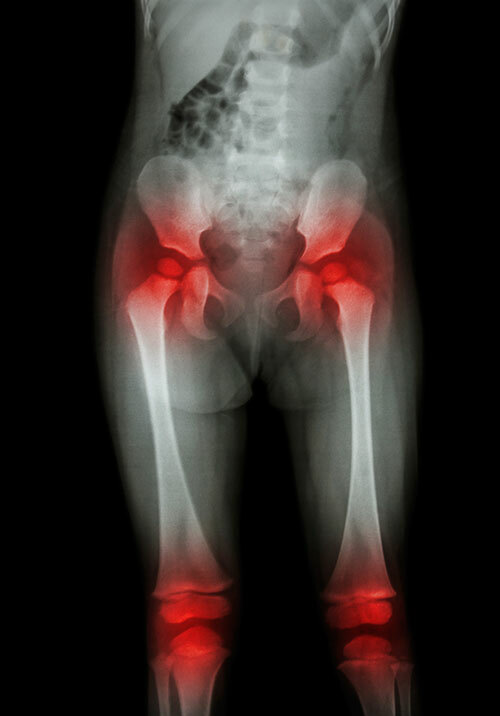 As they support the weight of our bodies in everyday life, our hip and knee joints frequently reflect the ongoing stresses subjected to them in the form of arthritis, tendinitis and ligament injuries. Over a lifetime of stress, the hip eventually succumbs to even minor injuries leading to fractures that lead to major morbidity. Knees are prone to injuries even sooner, the limb being exposed to forces when we fall or participate in sporting activities as examples. The physicians Charlottesville Orthopaedic Center are experts in treating these conditions, usually with non-operative techniques such as physical therapy, steroid injections or the latest in stem-cell and PRP technology. If the problem worsens, we offer in-office diagnostic arthroscopy or ultrasound that can many times avoid expensive MRI testing and confirm potential conditions that could be addressed with surgery such as minimally invasive arthroscopic techniques or larger joint replacements. Meet our Hip & Knee specialist and the other members of our expert medical staff. If you have neck and back pain, you’re not alone. Muscles in your neck and back can be strained from poor posture – leaning over your computer, hunching over your workbench, or lifting something heavy. Osteoarthritis is also a common cause of neck or back pain. Neck and back pain are rarely symptoms of a more serious problem. However, you should seek medical care if your neck or back pain is accompanied by numbness or loss of strength in your arms, hands, legs, or feet or if you have shooting pain down the arm or leg. That sort of sharp, shooting pain can indicate sciatica. Our team at Charlottesville Orthopaedic Center are specialists when it comes to neck and back pain. Meet the members of our expert medical staff. If you enjoy playing sports, you can rest assured that our physicians take a personal approach to getting you back in the game. We provide cutting-edge, minimally invasive treatment and surgery if needed and collaborate with physical therapists and trainers to optimize your recovery so that you can return quickly to playing the sport you love. Musculoskeletal ultrasound and Vision Scope are tools we use at Charlottesville Orthopaedic Center during your office visit to scan for problems and determine a plan for treating your condition – all without a costly MRI. Meet our Sports Medicine specialist and the other members of our expert medical staff. If you’ve suffered a fracture or other acute injury, our surgeons provide emergency services at the Martha Jefferson Hospital Emergency Department. Often, those fractures don’t require immediate surgery. When that’s the case, we care for you in our Charlottesville Orthopaedic Center outpatient office. Those types of injuries can be quite painful, we know, so we always strive to provide speedy office appointments – frequently same-day or next-day scheduling. As part of our advanced, nonsurgical treatment of fractures, we use thermoforming fracture brace to ensure a custom and comfortable fit. Meet our Fracture Care specialist and the other members of our expert medical staff. 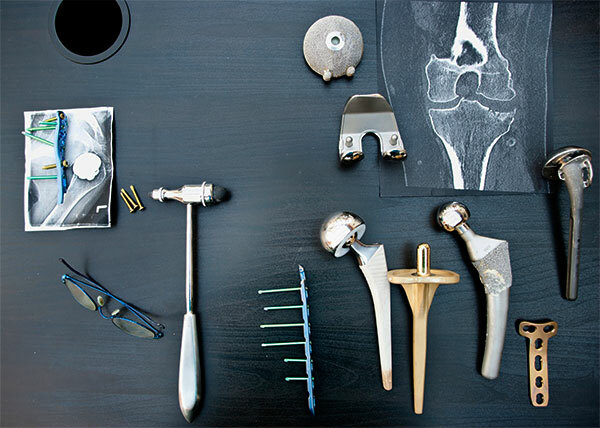 Advances in medical imaging allow the experts at Charlottesville Orthopaedic Center to perform procedures in the office that can replace the need for you to have surgery. Ultrasound imaging and fiberoptic cameras in the tip of a needle allow us to see what is going on beneath your skin. That means we don’t have to perform a costly MRI or invasive arthroscopic surgery. We can also perform ultrasound needle procedures to remove calcium deposits within tendons, break up scarred tendon tissue, and deliver powerful regenerative treatments. This procedure also helps you avoid a costly trip to the OR. The TENEX procedure uses ultrasound guidance to help treat worn down tendons as well. 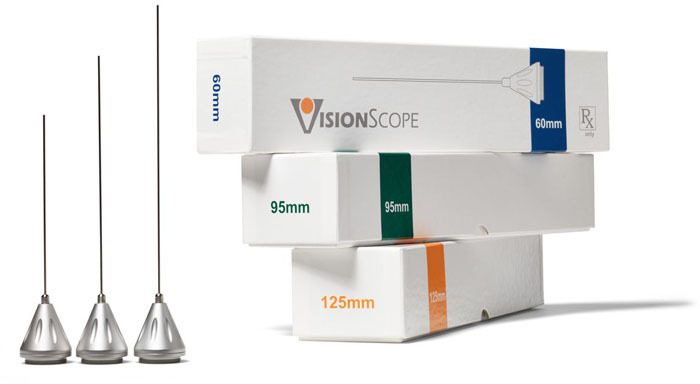 VisionScope technology is used for needle endoscopy. Meet our Minimally Invasive Orthopaedic specialists and the other members of our expert medical staff. Let’s face it: we’re all aging. And one of the conditions that often comes with age is joint impairment – pain, stiffness, and sometimes loss of function in joints such as knees and hips. Sometimes these conditions are brought on by a joint injury such as a fracture or severe sprain or dislocation. If you’ve found that physical therapy and injections no longer provide relief, then perhaps it’s time to consider joint replacement. The surgeons at Charlottesville Orthopaedic Center are experts in replacing many of the joints that are affected by injury or aging. Joint replacement surgery helps reduce pain and restore normal anatomical function so that you can return to the pleasures and activities in life that matter most to you. Meet our Joint Replacement specialist and the other members of our expert medical staff. If arthritis or other wear and tear conditions have you considering elective surgery or joint replacement, Charlottesville Orthopaedic Center offer platelet and stem cell procedures as an alternative treatment. With these new, cutting-edge options, you’re able to use your own body to help with the healing process. You’re also able to avoid lengthy periods of downtime and painful rehabilitation that typically follow invasive surgery. To learn more about Platelet Rich Plasma (PRP) and Stem Cell Therapy, please visit our Regenerative Therapies page. Meet our Regenerative Therapies specialist and the other members of our expert medical staff. 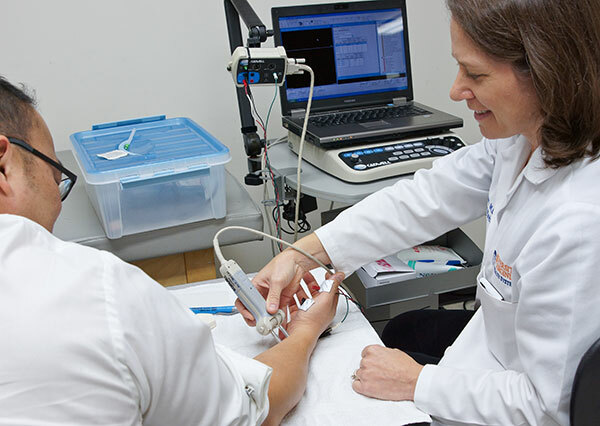 Electrodiagnostic medicine is the study of diseases of nerves and muscles. By conducting an electromyography, or EMG, the experts at Charlottesville Orthopaedic Center can see if your muscles and nerves are working properly. If not, this test helps us determine the extent of your disease and how to treat it most effectively. EMG stands for electromyography. This term is routinely used to describe specialized tests which involve electrical testing of nerves and muscles. The two most commonly performed electrodiagnostic tests are: Nerve Conduction Studies (NCS), Electromyography (EMG). NERVE CONDUCTION STUDIES: NCSs show how well the body’s electrical signals are traveling to a nerve. This is done by applying small electrical shocks to the nerve and recording how the nerve works. These shocks cause a quick, mild, tingling feeling. The doctor may test several nerves. NEEDLE EMG: For this part of the test, a small, thin needle is put in several muscles to see if there are any problems. It is used once for each patient and is thrown away after the test. There may be a small amount of pain during this part of the examination. The doctor tests only the muscles necessary to decide what is wrong. During the EMG test the doctor will be able to hear and see how your muscles and nerves are working by the electrical signals made by your muscles. The doctor then uses his medical knowledge to figure out what could be causing your problem. These tests are helpful in finding the causes of numbness, tingling, weakness, cramping, pain, or other loss of function. The doctor who performs and analyzes these tests can tell if your nerves or muscles are not working properly. Why is an EMG test necessary? An electrodiagnostic study is the only test of nerve function and it can determine if nerve damage exists. The test results will assist your doctor in establishing a plan of treatment specific to your needs. 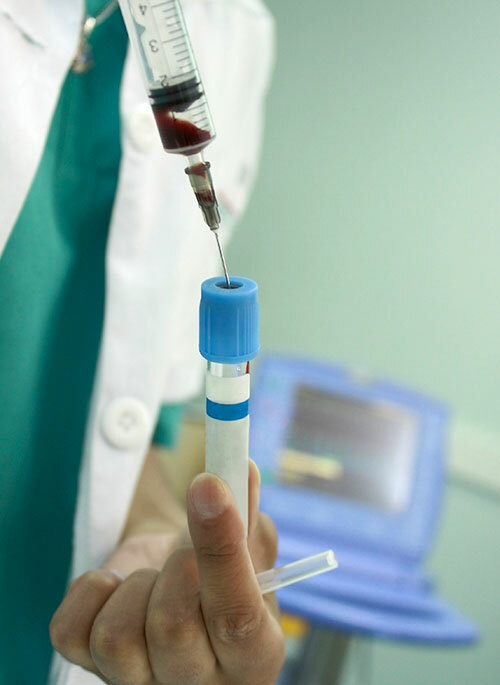 The American Association of Neuromuscular & Electrodiagnostic Medicine’s policy is that an appropriately trained doctor should do all needle EMG testing. A trained assistant or technologist under a doctor’s supervision can do nerve conduction studies. On the day of the test, do not apply lotions or oils to the skin. This is to ensure the adhesiveness of the electrodes and proper responses. Loose fitting clothing is recommended. Since a majority of the test is completed on your extremities, loose fitting clothes allow for better access. Certain areas are cleansed of any dirt and oils on the surface of the skin to ensure the best results. Depending on which area is being tested, you may be asked to lay down or sit upright. 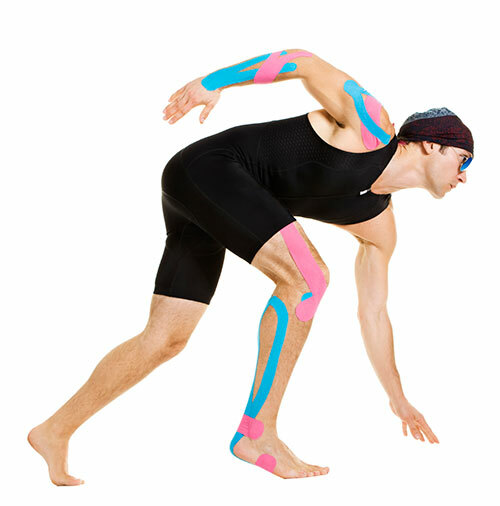 Electrodes are placed over specific sites on the extremities and small electric impulses are applied (NCV). The impulse is a part of the test and is harmless. During the latter part of the test, a tiny pin electrode (EMG) is used to measure electrical activity in the muscle. There are no lasting side effects from the tests, but the testing itself can sometimes be uncomfortable. The NCSs involve small electrical shocks to the nerve which may cause a quick tingling of pricking feeling along with an involuntary twitch of the arm or leg. EMG studies use a thin needle inserted into several muscles. These needles are disposable and a new one is used for each patient. Like any needle, some discomfort may be felt. The tests typically take 30 to 60 minutes depending on the complexity of the case. It is imperative to arrive 20 minutes early for your appointment in order to ensure adequate test time.